Canada is a vast sprawl of wilderness and stunning beauty with vibrant cities bridging the gap between mountainous landscapes. Each province has its own unique attributes, but they all have one thing in common, incredible cuisine. Across this second largest country in the world, Canadian chefs relish in its rich agricultural history and are dedicated to local farmers and producers. 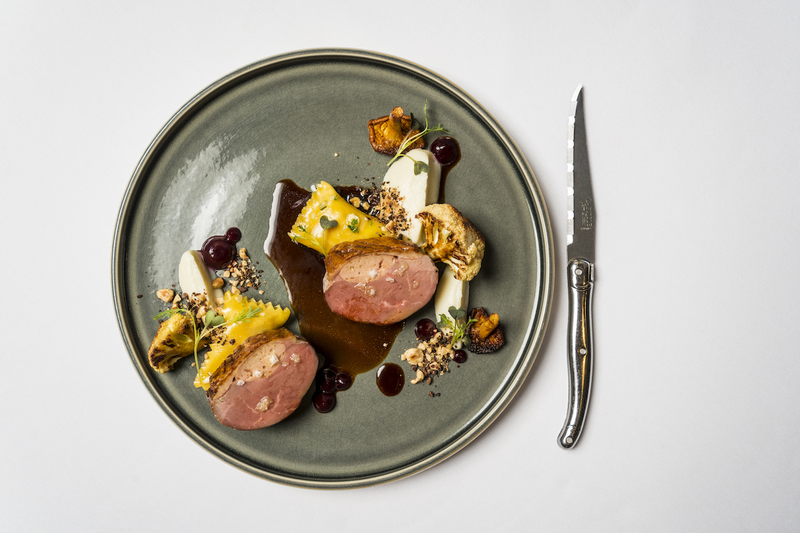 The art of culinary fun reigns supreme in Canada’s kitchens, where eagerness to share is matched only by the time and effort these chefs put into their food. In a land that covers 3.8 million square miles and the longest coastline on the planet it’s challenging to narrow the field, but here are six great Canadian chefs to watch. 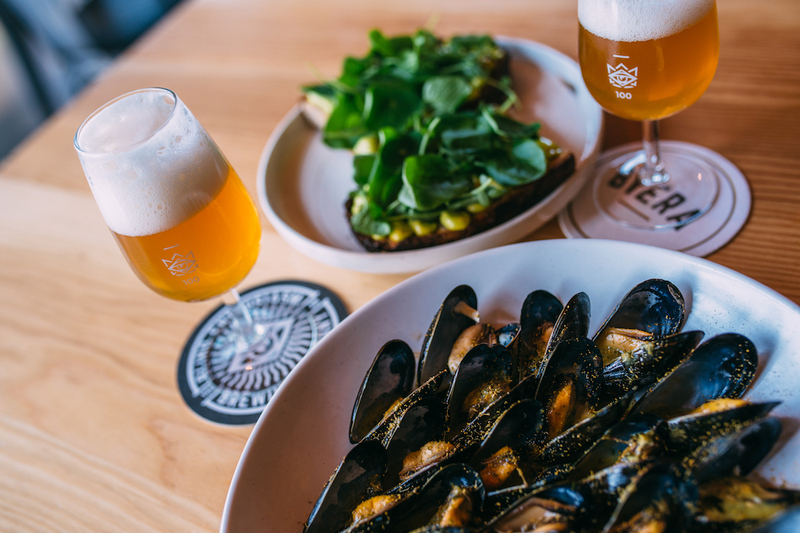 Part of the fun of leading Biera, a brewpub in Edmonton’s Ritchie Market, is how Christine Sandford is able to translate her winning attitude and enthusiasm onto the plate. 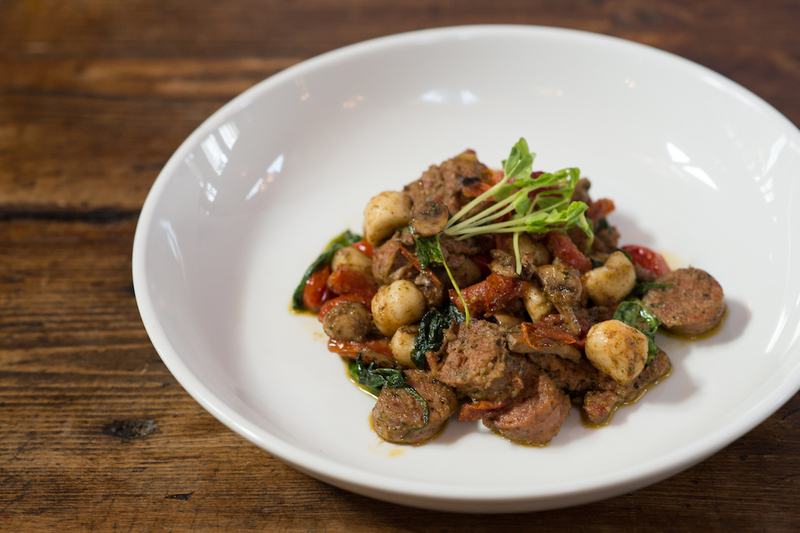 Sandford’s cuisine is evidence that high-quality beer and food are a perfect match. As Sandford says, it’s about highlighting flavours in the beer or food that complement one another. Sandford loves to travel and once spent a month camping with her chef beau in the South of France, where they visited local producers and brought ingredients back to the campsite to cook over the fire. She continues that tradition in several dishes at Biera, infusing what she learned from artisans on the road into the kitchen. 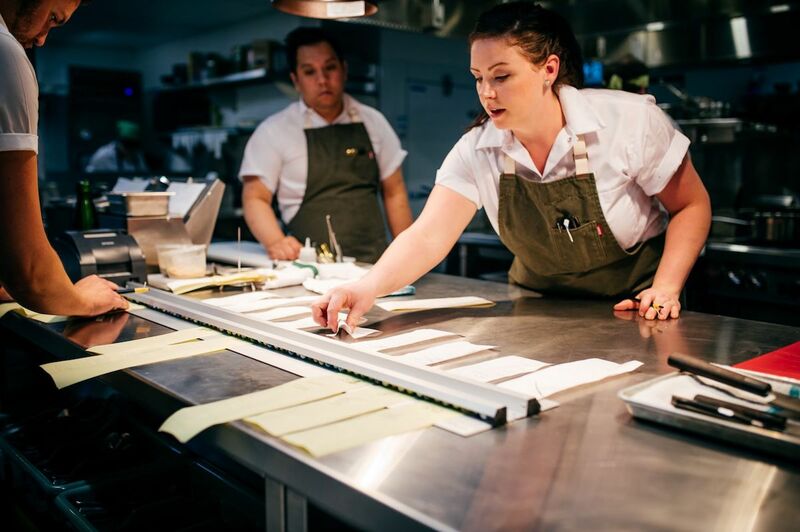 Sandford relishes time with her team, whom she calls extremely talented cooks, breaking bread together after a long week in the spirit of collaboration. In the coming months, as she endeavors to use everything she can before winter comes, she bulks up on preservation. Because produce is scarce during Canadian winters, Sandford keeps a pantry full of her favorite pickled and fermented items. 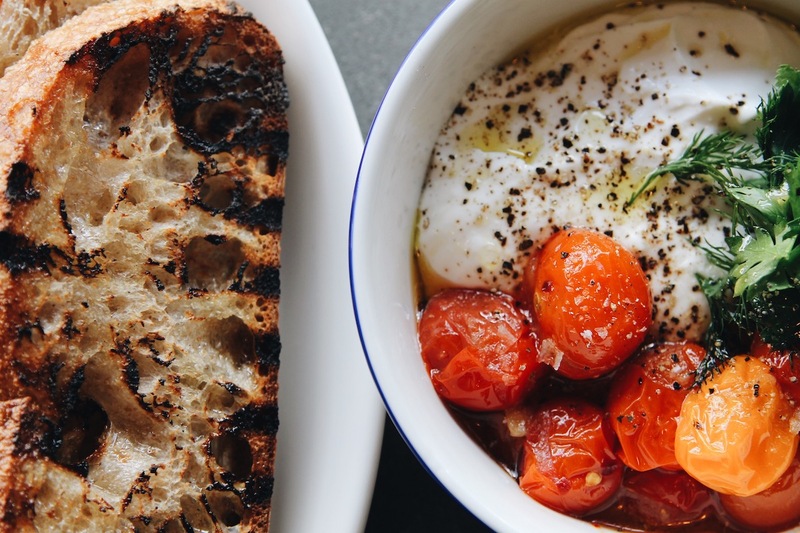 One of her signature dishes is Biera’s sourdough bread, with spent grains from the brewery and organic flour from Alberta, and she serves it with butter cultured in-house with kefir grains and whipped lardo, also cured there. She also suggests guests try any one of the dishes cooked over charcoal, like the pork shoulder on the bone, carved off and served with chewy dried and rehydrated beets and rhubarb, then glazed in meadowsweet verjus. Sandford makes her own vinegars, including beer vinegar and lemon geranium vinegar and never misses a chance to make her own miso from scratch. 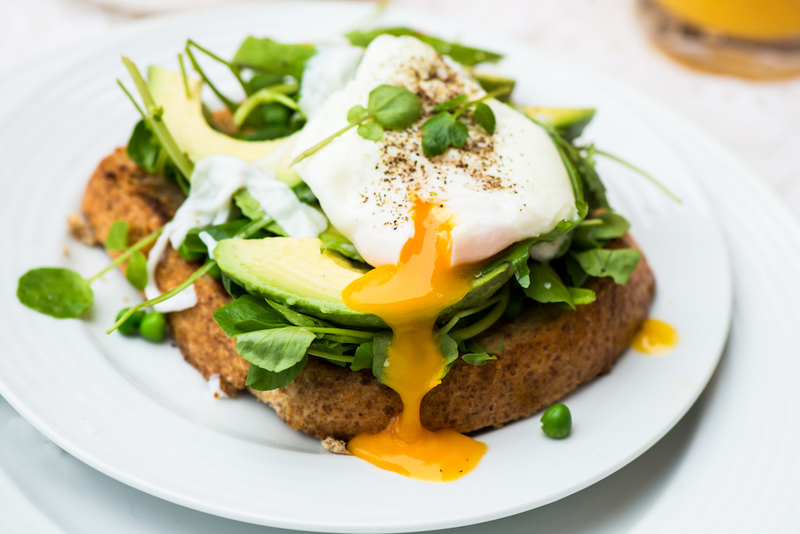 Biera, which is also one of Edmonton’s only cheese bars, doesn’t have lunch or brunch hours, but that doesn’t matter – for Sandford’s food fans, nothing beats Biera’s snack hour. The bevy of small plates and beer is an easy segue to the dinner menu. Don’t forget dessert, especially Sandford’s sourdough ice cream with buttermilk sorbet, milk crumbs, and cocoa nibs. Make a reservation at Biera-Ritchie Market. 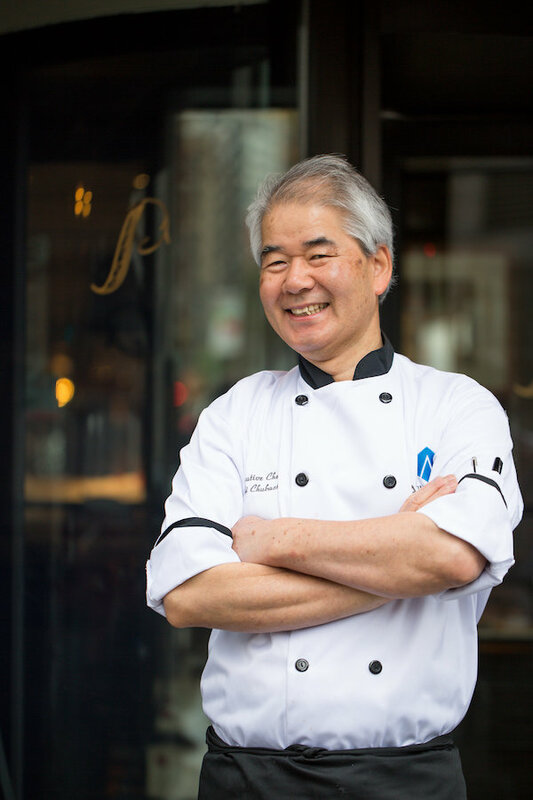 Master chef Yoshi Chubachi may have a string of accomplishments behind his name, but he is known as much for being one of the friendliest chefs in Canada as for his cuisine. Hospitality students from different colleges across Canada vie for coveted internships and the chance to learn from the man who came to Canada in 1977 as a Japanese Red Seal Chef. Chubachi’s ability to bring flavor to a plate date back to his time as a stagiaire in Japan and France. Azuridge, hidden away in the Alberta foothills, gives him a 13-acre platform on which to shine. The resort, which features a butler-in-residence program, is inspired by the history of the Canadian Pacific Railway. It is a frequent stop for the rich and famous, and Chubachi, who is also a skilled ice carver, strives to stun with every meal. 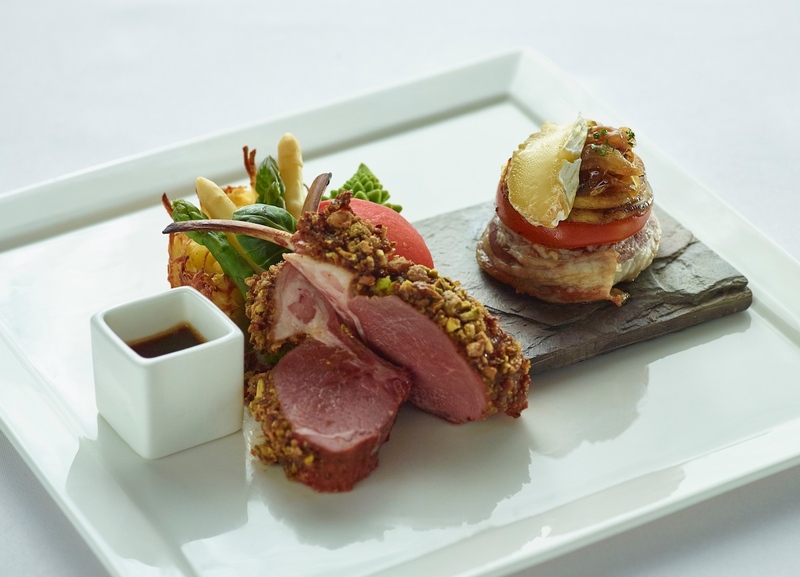 Expect Asian and French influences throughout traditional Canadian cuisine, including local game with tinges of inspiration by minerals and gemstones – a signature element since Azuridge is named for the mineral Azurite, known as the stone of heaven. Chubachi is famous for transforming the simple into the unforgettable — case in point, the Quebec-originated poutine at Azuridge, with potatoes fried in duck fat and topped with duck confit, cheese curds, and Grand Marnier duck au jus. December is an especially lovely time to dine with Chubachi when the resort produces a Christmas craft market with reindeer petting, shopping, and small plates from the menu like Waygu beef burger sliders and in-house smoked salmon on blini pancakes. Weekdays are for the resort’s massive three-story gazebo when Chubachi’s burgers and beer events are packed with regulars. Coming up, Chubachi is excited about more Canadian wild game and fowl this year, including wild boar, elk, venison, bison, pheasant, and partridge, and he can’t wait to serve it on the resort’s new colored china. His fans say that’s just fine, so long as that includes his famous elk Wellington. Make a reservation at AZURIDGE. Don’t let the jovial name fool you – Jellyfish is home to serious global flavors, courtesy of Mathieu Masson-Duceppe. Named by one of the restaurant co-owner’s children, Jellyfish is the product of Masson-Duceppe’s extensive travels and an homage to Montreal’s diverse culture. Masson-Duceppe says Québécois citizens are approachable and have big hearts with big emotion, and, as such respond to intense flavours and sharing of knowledge and cuisine. “I don’t just cook for Jellyfish or for me; I cook for Montreal,” he says of the city he returned to after working in Michelin-starred restaurants in France and Asia. The Jellyfish menu is a contrast between raw and oven-cooked dishes. 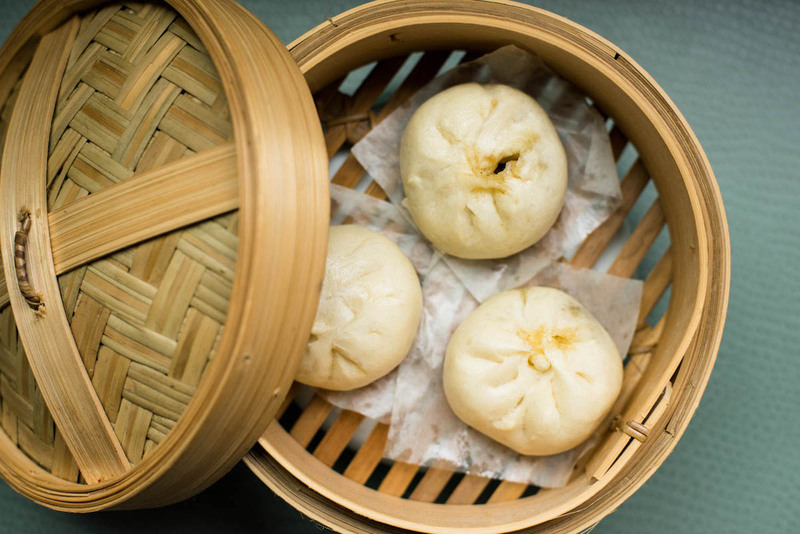 Masson-Duceppe hates the term fusion when it comes to dining, but he describes the Jellyfish sharing style as a combination of Chinese and Latino flavours. 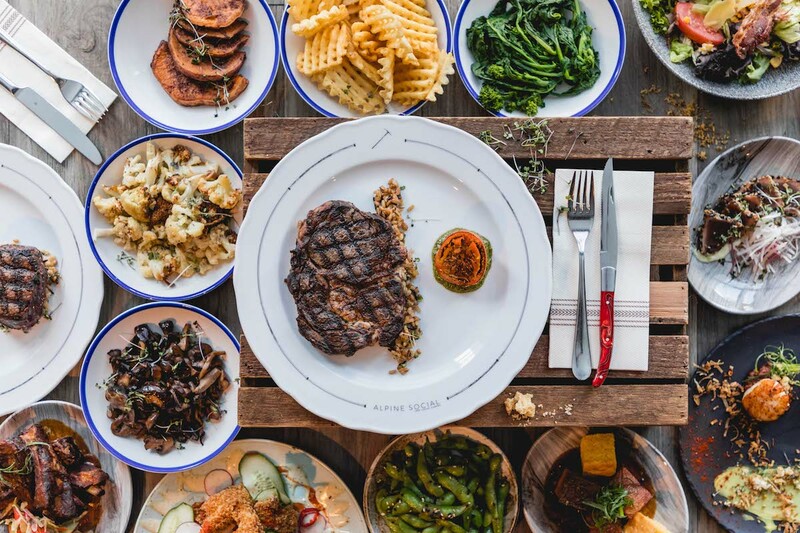 A few of his personal favorites include bone marrow-braised oxtail pasta, whole fried Japanese snapper, half chicken cooked with miso butter and stuffed with Boursin French cheese, and homemade kimchi with braised short ribs. He is always changing the menu but admits some items must remain. His regulars wouldn’t have it any other way. 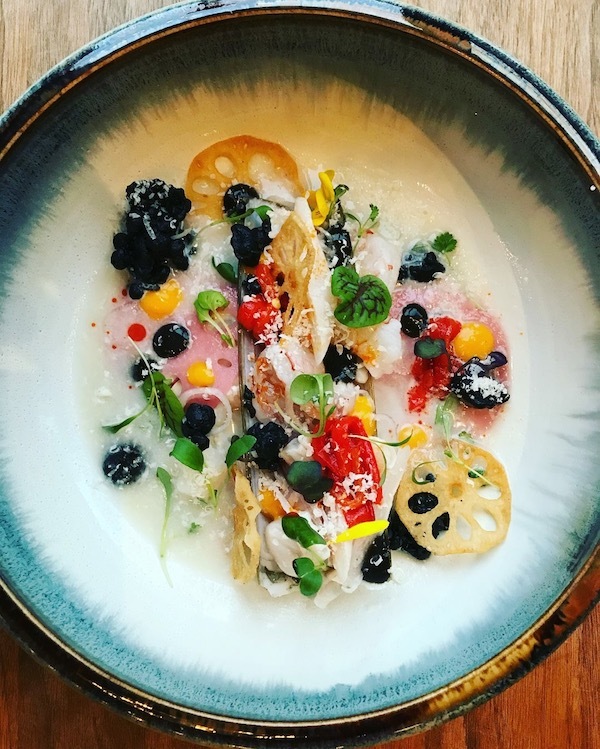 Another Jellyfish highlight is the crudo section with ceviche tartare sashimi and his favorite ingredients to showcase — vegetables. “Veggies are super cool,” exclaims Masson-Duceppe, who was inspired by learning from a Bohemian mother and Italian senora. Aside from the culinary side of Jellyfish, diners marvel at the intense romance of the décor including a massive set of chandeliers resembling — What else? — jellyfish. Make a reservation at Jellyfish. For David Bohati, life in the kitchen began early. 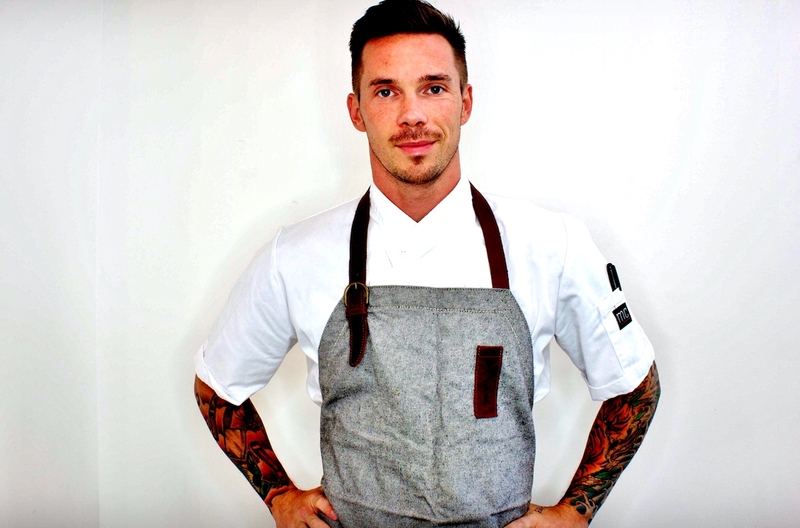 This enterprising chef worked his way up from washing dishes to leading one of Calgary’s best restaurants – no mean feat in a city that has become known for wowing gastronomes. One of the reasons dining at Teatro is special to Bohati is its environment. Housed in a historic bank building, the visually inspiring space with its high ceilings features a vault-turned-wine cellar that is brimming with what Bohati calls crazy labels and vintages and an open concept kitchen — an 8th Avenue and Olympic Plaza feast for the eyes. 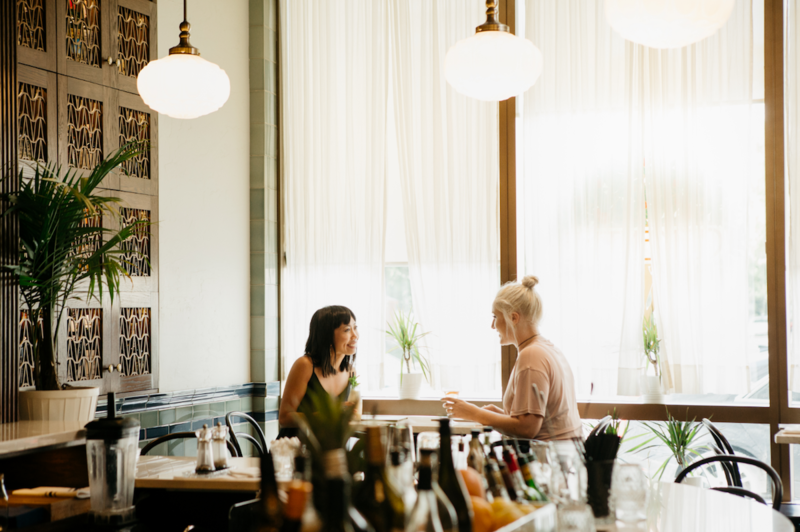 Bohati enjoys experimenting with the restaurant’s housemade pastas and charcuterie, and when winter cools Calgary down, Teatro heats up with a focus on clean and pure presentations of raw or gently cooked dishes. There is a daily play on crudo on the dinner menu, featuring everything from fresh Japanese fish, foie gras, scallops, Alberta lamb, and wild line-caught king salmon belly. Bohati’s dear friend happens to be his pastry chef Daniel “Papi” Ramon and he says Papi’s chocolate bonbons are a must-try even if a guest is so stuffed they can’t fathom another bite. He also recommends the tortellini in brodo. 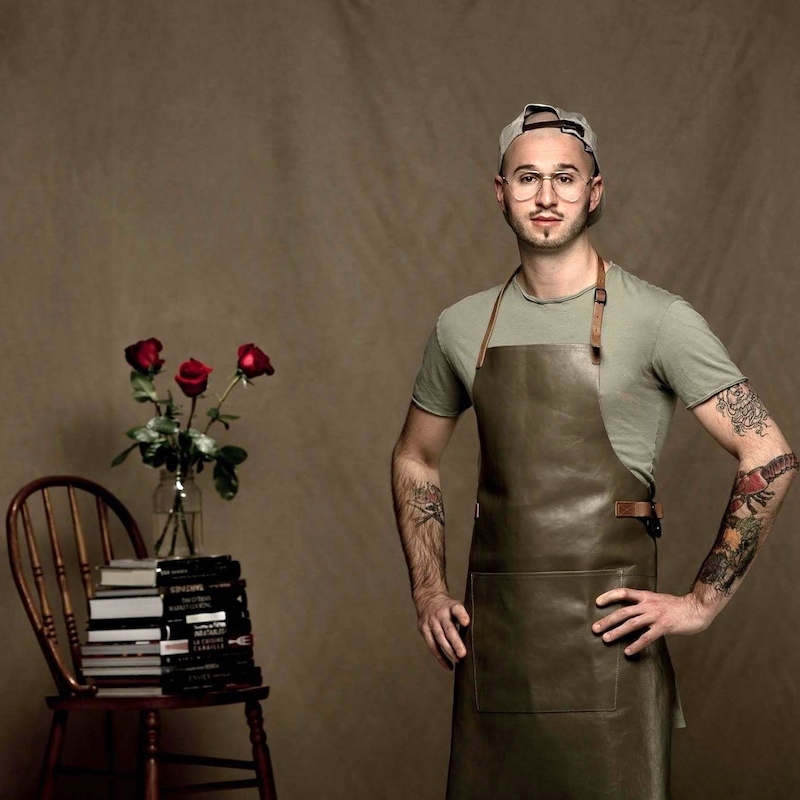 For functions, he has been working on a braised short rib steamed bao bun canapes with kimchi aioli, and he brings special attention to Teatro’s classic pork and scallops and his beet and umeboshi ‘gel’ he has been using for the past five years with fatty cuts of meat. This huge fan of Alberta beef always has Brant Lake wagyu in his kitchen and on his Instagram feed (@chefbohati), along with Alberta lamb. Make a reservation at Teatro. Just the thought of a glass of rosé — a beautiful bottle chilling in an ice bucket — is enough to send diners out into the heat of summer. Add a tasting of this crisp wine to the backdrop of Canada’s stunning landscapes and a plate of the country’s finest eats and any old day becomes an afternoon to remember. 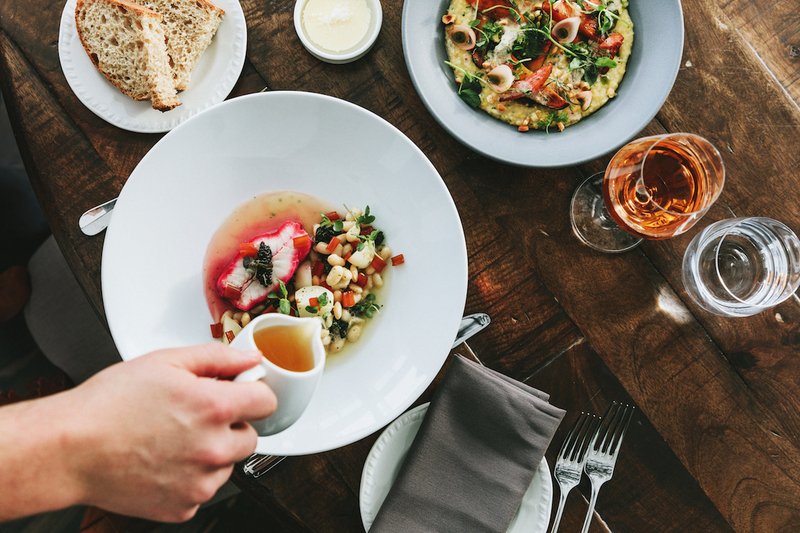 Throughout the nation, there is no shortage of fine dining at places where the wine list is as important as the food menu, especially during rosé season. 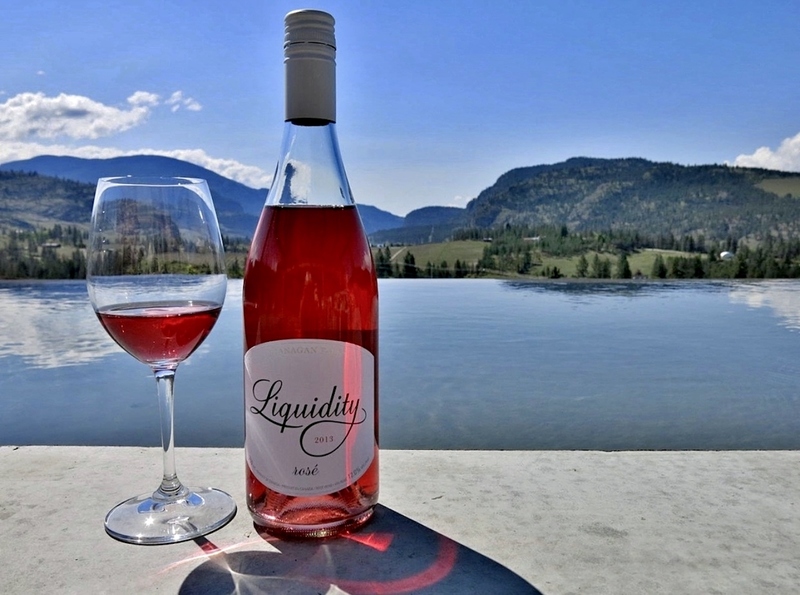 Here’s where to rosé all day in Canada. 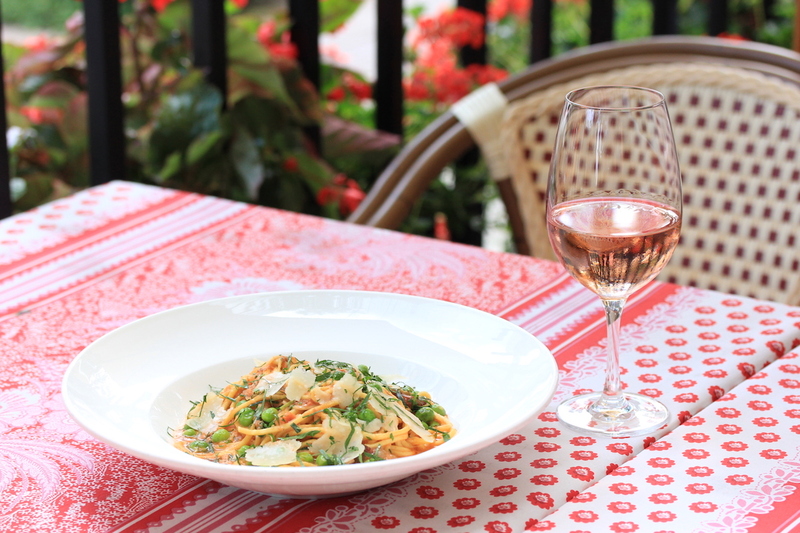 Aside from indulging in goodies like lamb tagine, chicken liver parfait, and gnocchi Parisienne, Biff’s Bistro has a specially curated rosé selection as part of its summertime “drink pink on the patio” rosé all day menu. With five rosés by the glass from Niagara, California, and France and 15 rosés by the bottle, the place to be at Biff’s is on the streetside patio, where imbibers sip on Provençal pinks and local wines courtesy of bar manager, a certified sommelier and winemaker Josh Kelly. Kelly’s top picks include Henry of Pelham ‘Cuvée Catharine’ Rosé, Tavel, Domaine Lafond Roc Épine, the Niagara Tawse Rosé, and the Spanish Raimat Rosado. Biff’s patrons pack the patio to hear Kelly’s sage advice and discover a few new favorites. Make a reservation at Biff’s Bistro. Prairie and European inspiration define BIERA at the Ritchie Market. This is a beer lover’s brewpub, freshly brewed by Blind Enthusiasm, but BIERA is also the ideal destination for a glass of Canadian rosé to go with chef Christine Sandford’s ethereal creations. Share an order of chickpea pancakes with burdock root and egg butter or Shropshire blue crackers with her housemade cream cheese and shishito sambal. After 6PM, fire up your charcoal appetite with some Acme chicken, Broek Acres pork shoulder, and beef minute steak. Make a reservation at BIERA-Ritchie Market. 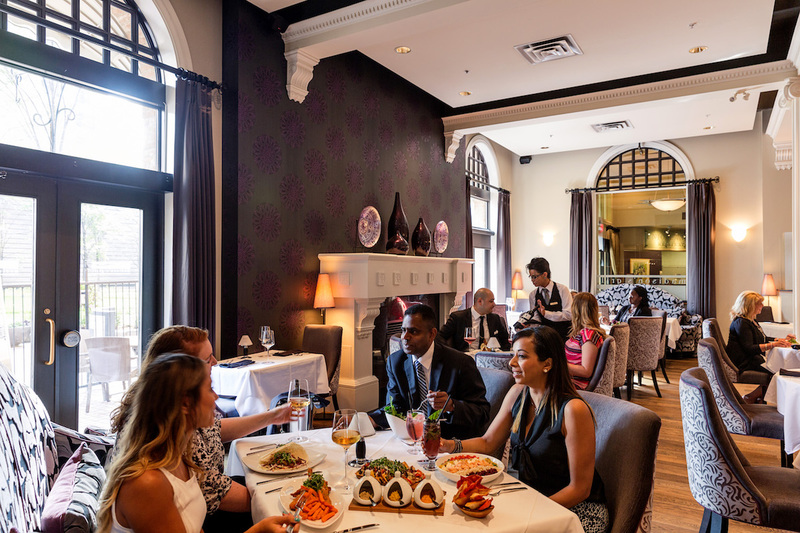 If freshly shucked oysters and fermented hot sauce followed by nettle and ricotta dumplings, duck confit, or lamb loin doesn’t draw you into Deane House, the opportunity to split a bottle of cold rosé in this gorgeous old house will. Home to Canadian cuisine with peak seasonal ingredients from the region, one of the best options for dinner here is the Spatchcock chicken which serves two – a perfect pairing for one of the several rosés available here, courtesy of the legendary spirit of Deane himself. Make a reservation at Deane House. Nowhere is ‘La Vie en rosé’ more apropos than at Figo, a restaurant that is itself as light and airy as the rosé patrons drink here. 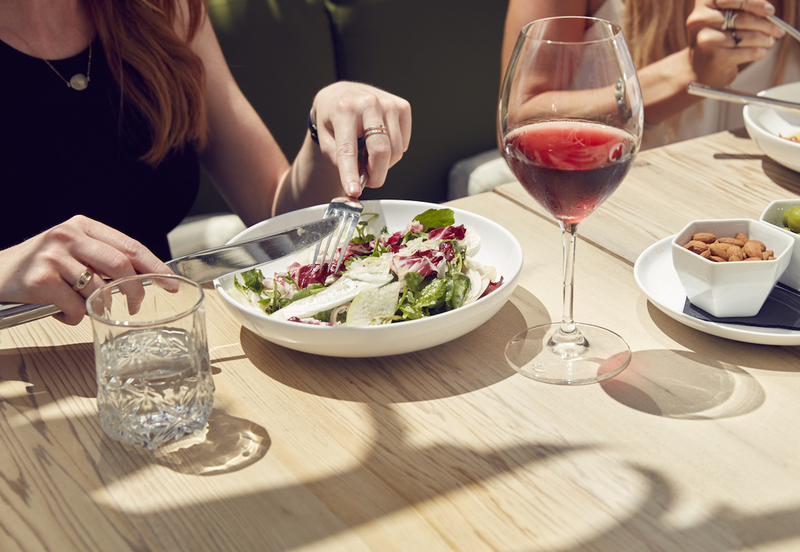 Unpretentious and palatable, especially when consumed on Figo’s festive patio, the rosés on this wine list make flawless pairings with tuna carpaccio, whole branzino, arancini with wood-roasted tomato sauce, and all of the housemade pastas. Of special note, guests go berserk for the house crispy potato with pepperoncini salsa verde. Save the last glass of rosé for the sea salt and amarena cherries garnished panna cotta. Make a reservation at Figo. Take a tour of rosés at Bar Clementine from the Haywire Gamay Noir Rosé of Summerland, Canada to the Batič Rosé from Vipavska Dolina, Slovenia with a stop in a glass of French Beaujolais or Chinon Rosé in between. Don’t forget to order a few vittles for nosh – like the irresistible courgette blossom tempura with auburgene and moromi, with a helping of blue cheese-butter poached Atlantic ling cod with fennel, bell pepper, and salumi. The wine and food at this feel-good Oliver neighbourhood a la early 20th century French Art Nouveau pub is perfectly matched with the atmosphere. A nod to classic bartending and the art of lounging, Bar Clementine is a total darling. Make a reservation at Bar Clementine. 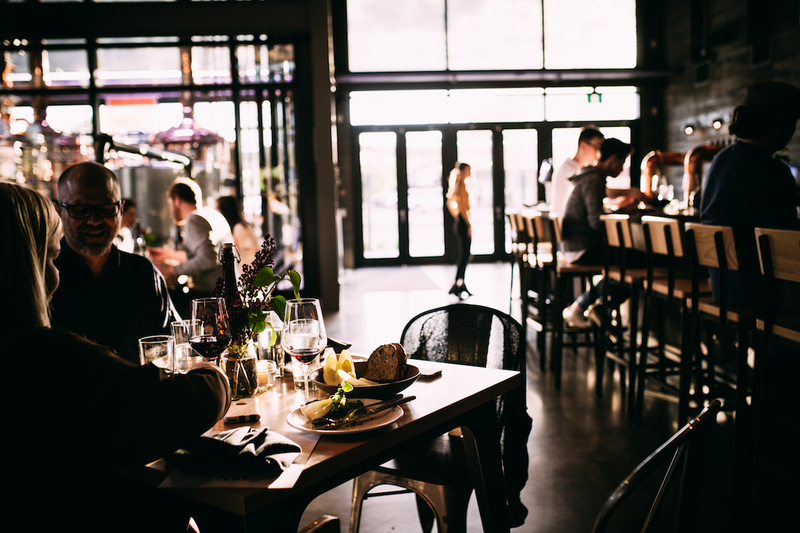 With so much to see, eat, and drink at Liquidity Wines and Bistro, every meal is special at this winery/bistro/art gallery. But one of the best times to celebrate rosé is during the brunch hours when diners can sink their taste buds into chorizo hash with crispy egg and aged cheddar or a buttermilk biscuit Eggs Benedict with smoked chervil hollandaise – just don’t forget to save room for a rhubarb scone because it pairs perfectly with Liquidity’s recent releases. They include the winery’s own 2017 rosé that harkens to strawberry yogurt, rhubarb, and hibiscus aromas with a delightful hint of cranberry and Campino candies. Liquidity’s new exhibition, “Photo Ark” by National Geographic is on display through early September. Make a reservation at Liquidity Bistro.